The City of Palm Springs ID #2783. 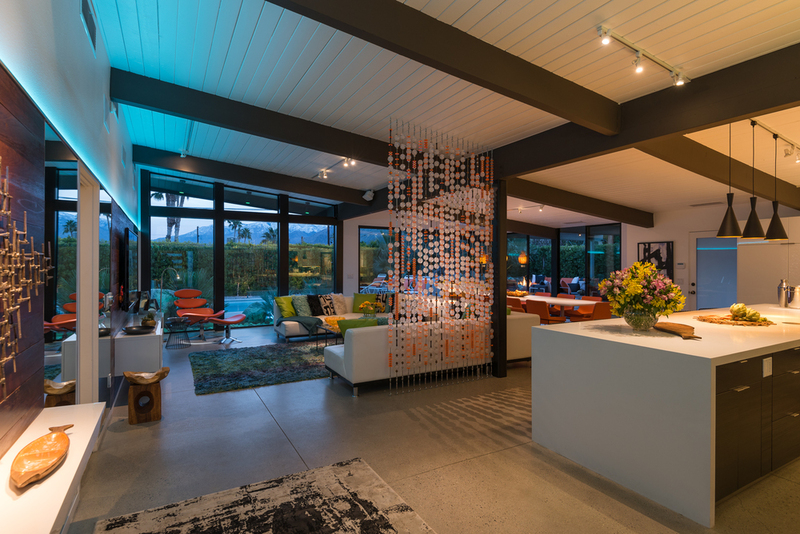 This unique designer home combines an artistic mid-century design with a whimsical touch of Tiki, boasting over 4,000 sq. ft. of combined indoor/outdoor living space. 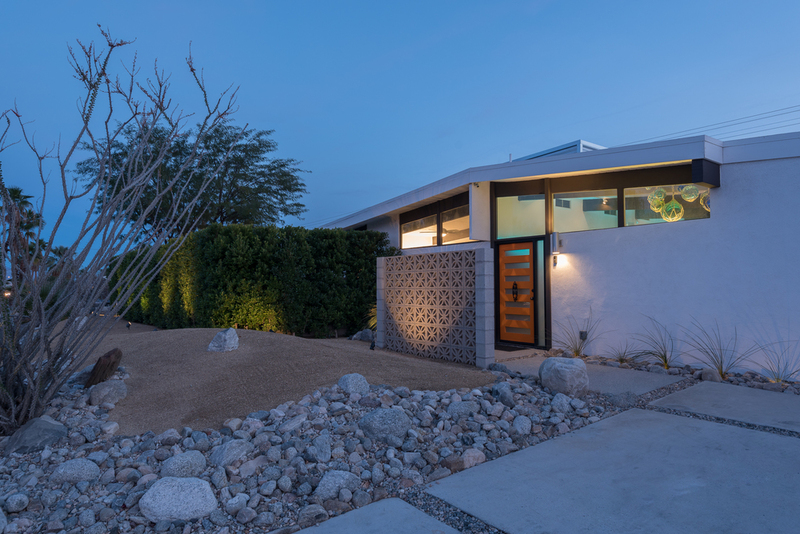 This luxurious, newly remodeled custom mid-century modern Alexander home was originally designed by famed architect William Krisel and is the largest home of its kind in the Racquet Club Estates enclave. With 6 bedrooms, including a large casita with two king beds and a kitchenette, the house easily accommodates up to 14 people for sleeping, eating and lounging together both indoors and out. Call us at (760) 898-9116 Pacific Standard Time. or Email us anytime. 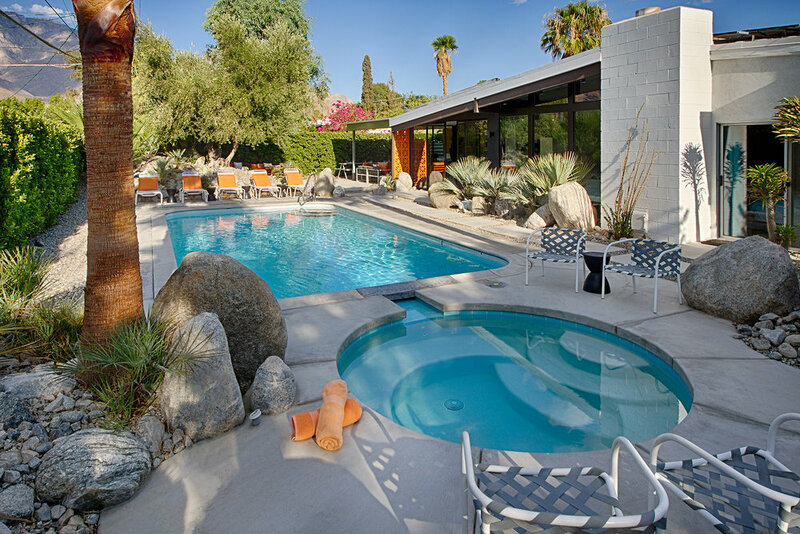 We invite you to come stay with us and discover the promise of Palm Springs realized. 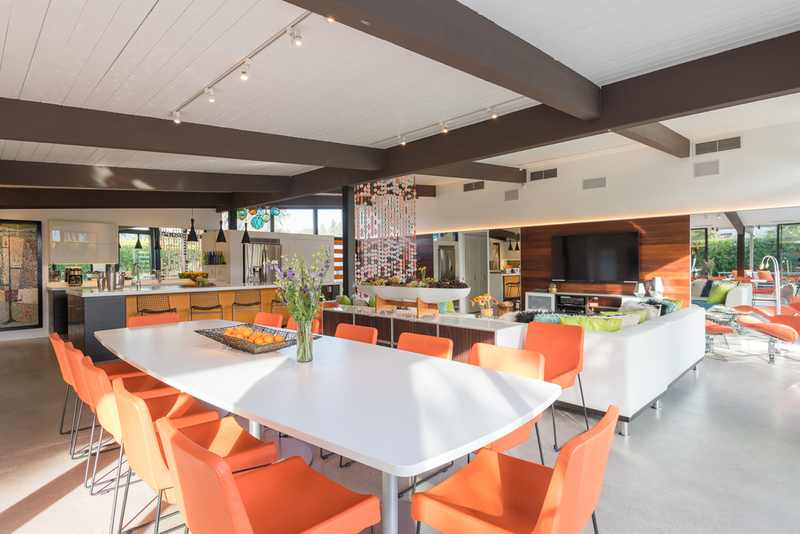 Completed in January 2015, the renovation and expanded post and beam addition honors the architectural integrity of the original 1959 Alexander home by architect William Krisel while expanding the design to provide a huge open-concept great room with kitchen, dining and living areas that provide warmth and intimacy while also supporting a spacious shared experience for everyone together. This is a fully green home powered by a whopping 16kw solar system, 12 tons of super efficient heating/air, state-of-the-art LED lighting throughout including touch-controlled color-changing LED mood lighting. The updated media and internet technology includes LED TVs and satellite TV in all bedrooms, USB charging ports throughout the home, video doorbell/phone/intercom system, two LED 70-inch TVs, Apple TV, Chromecast, Blu-ray/DVD/CD, house accounts for Netflix and Pandora, 5.1 home theater audio system, and super high-speed internet with full coverage throughout the property. The living room features seating and dining for up to 14 with extra deep sofas perfect for curling up and relaxing with cocktails or enjoying a movie with the family on the 70” 1080p LED HDTV. 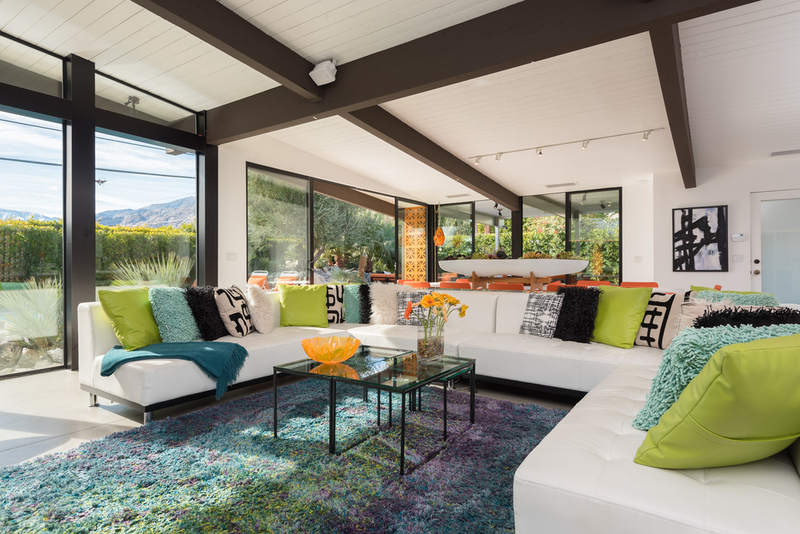 Open the glass sliding doors to the covered patio to enjoy the mountain views and true indoor/outdoor living. A huge island/bar with seating for 4 or more opens into the newly remodeled kitchen from the lounge. Brand new high gloss cabinets, quartz counters, sinks, faucets, appliances…you name it, its new and we've probably got it! A true gourmet kitchen that makes preparing meals a joy. There's no limits on entertaining with three kitchens, including four sinks, three dishwashers, three refrigerators, a 1,200 watt microwave, upgraded 5 burner stove top, convection oven and a well-appointed complement of small appliances, cookware and large serving pieces. 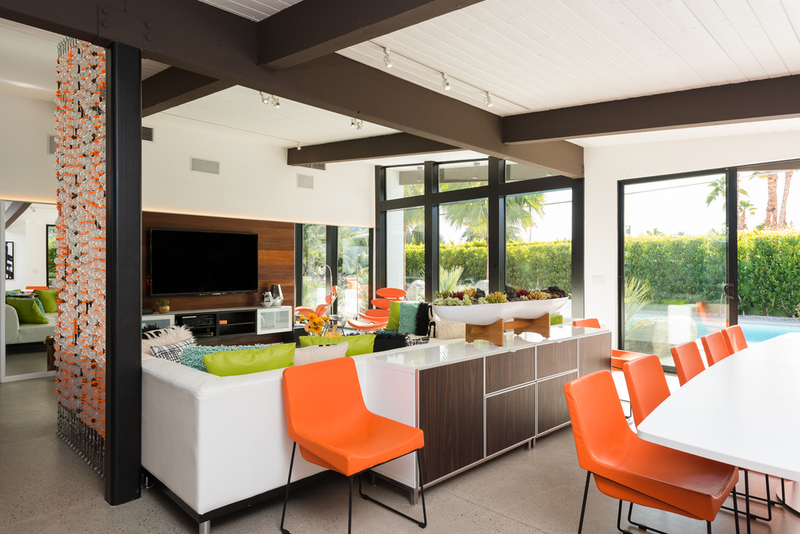 You'll love the 14-foot island/bar, with plenty of room to cook, serve cocktails or create a buffet line with adjacent table seating for up to 14 people both inside or outside. 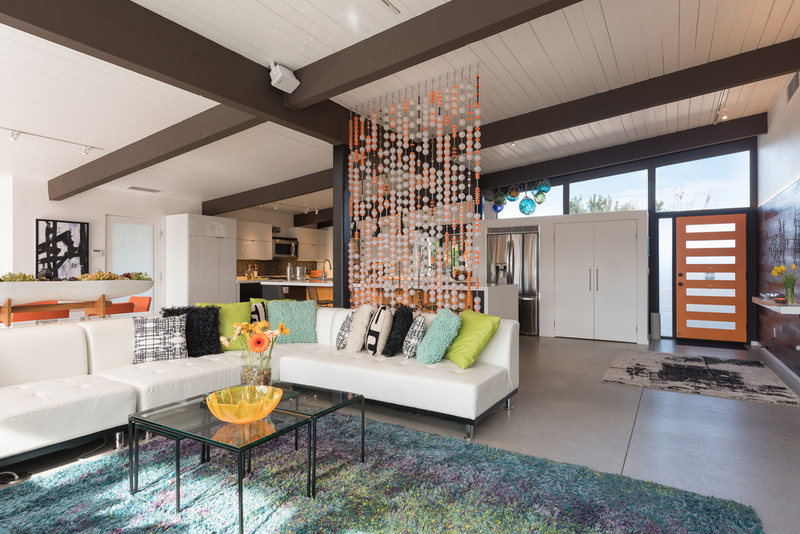 The living room, dining/lounge area and kitchen are open and flow onto to each other allowing complete interaction with friends and family no matter where you are. You can be in the kitchen preparing meals and still interact with your guests and family in the living room or lounge. True open concept living at its very best. The private outdoor space includes amenities such as a private outdoor shower, two shared and four private patios, chaises and enough seating for everyone amidst the lush landscaping and outdoor lighting featuring a simulated "under sea" grotto feeling. 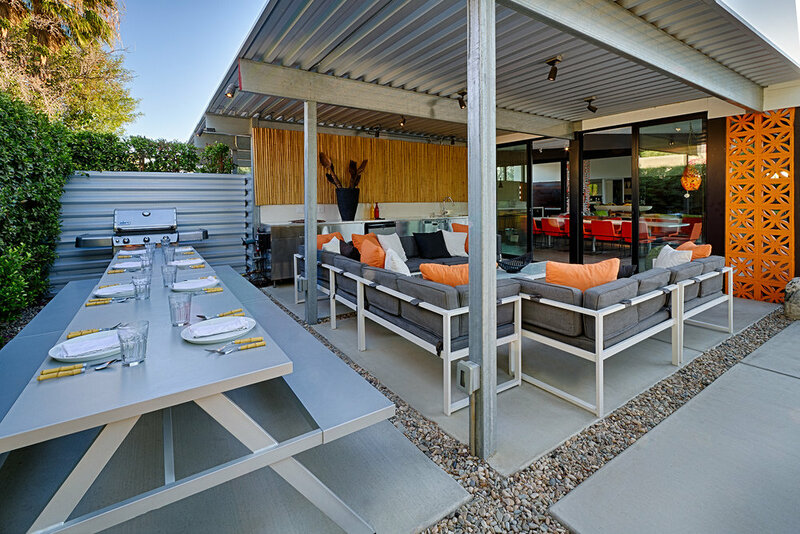 The outdoor shaded patio includes comfortable padded lounge seating, a refrigerator and sink, BBQ, picnic tables and a great view of the 70-inch TV. So, sit back, Airplay your favorite movie and grab a cold beer without heading indoors! Or snuggle into the plush fireside seating under our watchful tiki (named Yul)... It's our favorite spot to hang and relax with good friends, cocktails and conversation. Relax under the palm trees on a cabana bed that overlooks a 10-person spa and a very deep, fully-tiled, ultra private pool set within a fully walled and hedged perimeter giving you complete privacy and making you feel like there is no one else around. On the far side of the pool is a queen-size outdoor queen-size lounge bed perched above the oversized spa and ringed with multiple chaise lounges--the perfect place to curl up for an afternoon nap, read a book, watch the kids play in the pool or to get some sun. It's like having your own private resort; you’ll never want to leave! Outdoor plugs and WIFI are available so bring your iPad or laptop if you need to catch up with the rest of the world. We know you like your high tech entertainment and goodies as much as we do, and here are just some of the features we’ve got for you. 70” LED 1080p HDTV in the living room, LED HDTVs in all 6 bedrooms. DISH whole house HD DVR including HBO, THX 5.1 Surround Sound, Blu-Ray/DVD/CD. Internet Connected TV with FREE house accounts for Pandora, Netflix, YouTube and more. Google Chromecast input for your Android device or laptop along with an HDMI input for your game system (you may need your own device adapter). Apple TV with iTunes Airplay (sit by the pool and wirelessly playback your iTunes movies or music on a PC or Apple device). Hidden color-changing LED mood lighting with remote control. Super-fast WIFI with outdoor extenders will easily handle large demands and allow you to connect anywhere on the property. Video Doorbell and security system. State-of-the-art NEST 3 zone heating and cooling system. Wireless phone system with intercom and unlimited U.S.A long distance, iPhone chargers and docks in every bedroom. Built-in USB wall-chargers in main areas, bring your own adapter. The first 5 bedrooms are located in the east wing of the house and are separate from the new west wing/great-room addition. The east wing has a separate heating and cooling system dedicated exclusively for the bedroom areas. Bedrooms feature various amenities including desks, seating and even a cozy and romantic fireplace in bedroom 5. Bedroom 3 and 4 have private outdoor patios and bedroom 3 has no direct pool access, perfect for small children. The master suite is huge casita separated from the main house with almost 300 square feet of quiet space to relax; it includes two king size beds, kitchenette with refrigerator/ice maker, individual heating and AC system and a seating/dining area for 4 people. 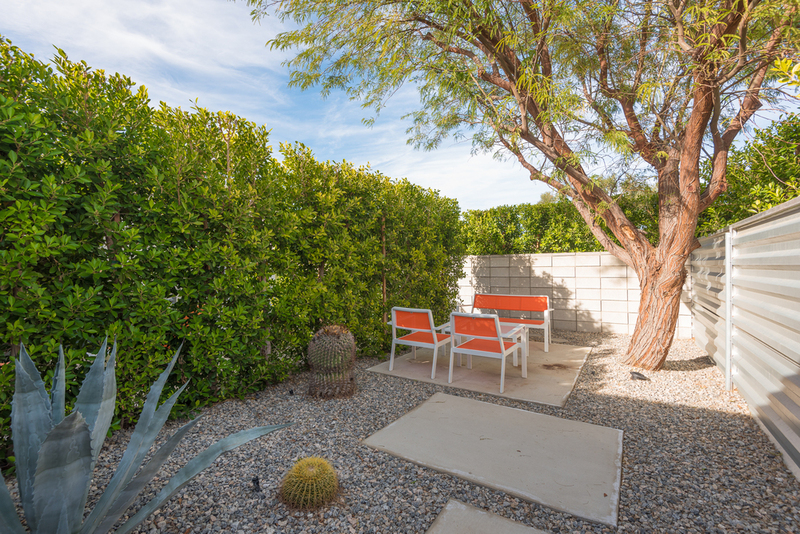 The master also includes two private patios as well as an outdoor shower. All bedrooms feature 1080p LED HDTV's, high thread count 100% cotton sheets, iPhone chargers and docks. Super-fast whole house WIFI allows you to connect anywhere on the property. 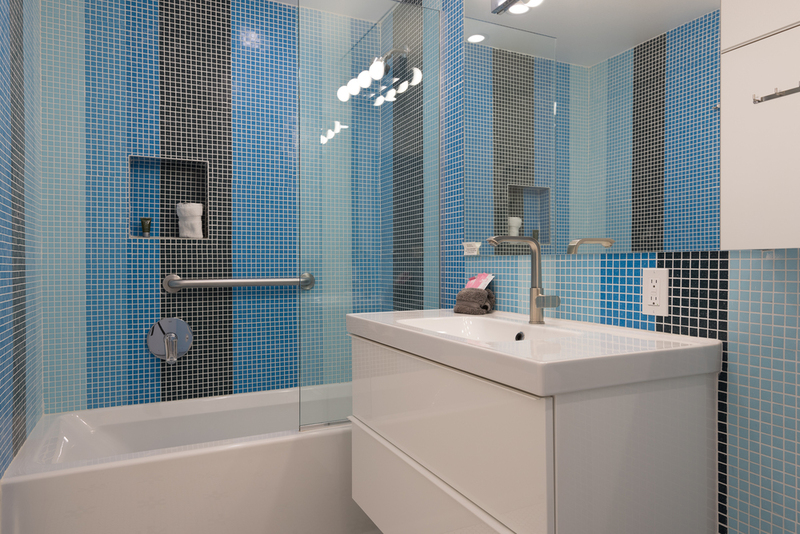 The house features 5 bathrooms, so there is never a wait to shower! And to make sure there is plenty of hot water we’ve installed a state-of-the-art large capacity hybrid hot water heater capable of producing 165 gallons of hot water in the first hour!